Bangkok (Thailand) – October 1, 2018 (travelindex.com) – Come and feast on great tasting cuisine by legendary Michelin-starred Chef Akira Back who has designed a special menu inspired by his happy childhood memories and life journey. Food lovers will enjoy a long culinary journey to explore and savor Akira’s East-meets-West cuisine that’s cooked using top-quality ingredients. A special night of fine dining is set in an impressive atmosphere at Akira Back Restaurant & Bar, Bangkok Marriott Marquis Queen’s Park. Bangkok Marriott Marquis Queen’s Park – the posh, prestigious Marquis-branded hotel that’s Bangkok’s biggest – presents great tasting specially prepared cuisine by Michelin-starred Chef Akira Back. The chef has received widespread international acclaim for his East-meets-West brand of cuisine that is distinctive and unlike any other. Born in South Korea but raised in the United States, Chef Akira has created a new style of food that’s a fusion of fresh and elegant Japanese and Korean cuisines and fun American food. His cuisine reflects his happy childhood memories and his life journey through the passage of time. In addition, Chef Akira Back owns Akira Back Restaurant & Bar, his first and only restaurant in Thailand, which is located on the 37th floor of Bangkok Marriott Marquis Queen’s Park. The restaurant presents contemporary cuisine in the style of Chef Akira that is both exciting and colorful. The restaurant is made up of a main dining area, a sushi bar, Omakase Bar and four private dining rooms offering a breathtaking panoramic view of the cityscape through floor-to-ceiling transparent glass window panes. The four private rooms altogether have a seating capacity of 100. For an impressive night on September 19, 2018, Chef Akira Back made a special appearance at the restaurant to stage a Chef’s Table and present a repertoire of his amazing dishes that are current bestsellers at Akira Back Restaurants & Bars the world over. These included Tuna & Eringi Pizza, which is one of his signature dishes. Presented in Chef Akira’s personal style, the crispy crust – topped with umami aioli, fresh tuna sashimi, micro shiso and white truffle oil – redefines the traditional concept of pizza. Jeju Domi is a sashimi dish that Chef Akira ate as a child. Back then he didn’t want to try sashimi, so his father gave him a snapper with chojang sauce. This simple dish has been given special treatment with orange-infused tobiko rolled inside the snapper. Another sashimi dish, Salmon Tiradito, blends the style of Peruvian ceviche with a twist of charred mango, yuzu lemon and cilantro oil. One of Chef Akira’s most famous dishes, AB Tacos, reflects his American heritage. This modern twist on the classic Tex-Mex dish features tacos stuffed with Korean-style wagyu beef bulgogi and topped with roasted tomato ponzu. Meanwhile, Jidori Chicken is his version of teriyaki chicken, cooked sous-vide and served with velvety potato purée. The special evening also showcased several inventive seafood dishes including Scallop in a Half Shell, sea scallops and their roe cooked under a charcoal robata grill and served with kimchi, bacon and a kochujang butter sauce; Una-Q, kabayaki-style unagi eel with seared foie gras and balsamic soy; King Crab Legs served with Chef Akira’s “Dynamite Sauce” and pickled shimeji; Pan-Seared Halibut; and Butter Poached Lobster with nori butter. This was followed by Chef Akira’s mouth-watering 48 Hrs Wagyu Short Ribs – an elevated version of his mother’s short rib stew, which sees prime ribs slow-cooked for two days in a traditional Korean kalbi jjim marinade, and served with a sensational sauce made from the cooking process. 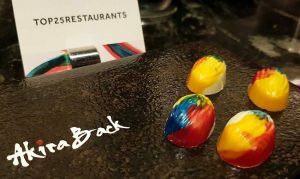 This exquisite tasting menu concluded with Chef Akira’s signature Sujeongwa AB Eggs and Chocolate Bonbons, that left a lasting impression on diners. Akira Back restaurant at the Marriott Marquis Hotel Bangkok is highly rated in the Top25Restaurants in Bangkok by Travelindex and the trusted Restaurant Rating Index. Akira Back Restaurant & Bar of Bangkok Marriott Marquis Queen’s Park is open Sunday for lunch from 12.00-14.30, and daily for dinner from 18.00-23.00. For more information and reservations, please call 02 059 5999 or email restaurant-reservations.bkkqp@marriotthotels.com . The largest hotel in Bangkok and the first Marriott Marquis hotel in Asia Pacific, Bangkok Marriott Marquis Queen’s Park is a new landmark in heart of the Thai capital. The resort offers extensive facilities, including more than 1,388 rooms and suites, over 5,000m² of function space across 37 venues, two swimming pools, the Quan Spa and a collection of restaurants and bars. Centrally located on Sukhumvit Road, in Bangkok’s vibrant business and entertainment district, the hotel is the perfect choice for all travelers to this pulsating city.